SO MUCH to talk about from last night’s finale. Based on what I’ve been reading on Twitter and hearing from friends, I have a very different take on what went down last night. I don’t think Peter was just being uber realistic – I think he didn’t want to be with Rachel. I don’t think Rachel was just looking for a ring, I think she was asking Peter to take a leap of faith with her and he wouldn’t. I have been #TeamPeter all season long. This is not a vendetta I have against Peter. This is just my analysis of what went down during Peter and Rachel’s last two dates. I am analyzing this within the confines of this show. This is not just two people who met in public – they met on a reality dating show that ends in an engagement. Rachel, as the lead, has to cooperate (obviously she can buck the rules, we’ll get to that later) but we can’t forget the context of these interactions. The Bachelor and Bachelorette end in engagement. Full stop. In the past ten years, only ONE lead has left the show without getting engaged – our favorite bachelor, Juan Pablo. No Bachelorette has ever left the show without getting engaged. It’s not a rule, because you can’t force anyone to do it, but it’s damn near close. If you listen to the leads discuss their relationships post-show, without fail each of them will say that the engagement was the start of their real relationship. I have not heard a single one say that they knew they wanted to get married right away. No couple goes on After the Final Rose and says they’re already planning their wedding. ALL of them say they are excited to start seeing each other in the normal world. From there, who knows? We know the stats. Most of them do not end in marriage. See the above from former Bachelorette Ali on her blog today. Within this universe, an engagement doesn’t mean what it means after you’ve been dating for a normal amount of time in the real world. It’s an “engagement” – a promise to keep seeing each other. That’s not to say that engagement isn’t important. Peter has a valid point. You only get to say those words “will you marry me” for the first time once. But it is well known that an engagement on this show is only the beginning of a relationship. Peter’s insistence that engagement is the same as being married has no place on this show. HEAR ME OUT. If Peter knew he felt this way about engagement, he should never have gone on this show. But we know people go on the show for lots of reasons, not just love. So let’s say he realized that he was having feelings for Rachel but KNEW he couldn’t propose? He should have left before final 2. Lots of people have done it. Graham left DeAnna’s season after hometowns. Ali left Jake’s season after hometowns. Frank left Ali’s season right before fantasy suites, throwing her into a tailspin. And how can we forget Brooks leaving Desiree right before fantasy suites? We all thought Brooks was the one for Des and she ended up marrying her “consolation prize” Chris. They have a baby now. These people meet on a show and they have to follow the show’s rules to get to the end. Remember Kaitlyn and Shawn? They literally fell in love with each other at first sight. Kaitlyn told him he was “the one” off camera in like week 4. They still had to go through the whole show, and she even told him that the only way this works is if he sticks around. The lead cannot leave the show because the person she likes best leaves. She is contractually obligated to see it through. If you care about the lead, you have to go through all of it. It doesn’t necessarily mean you have to get engaged at the end, but you’ve seen the numbers. Everyone does it. Rachel and Peter have always been cute. I loved them together from the start. But Peter was always reserved compared to the others. I thought that was just his personality, but starting with the Fantasy Suite date I started to think he might just not be that into her. I’ll take this moment to say that I really do think Peter had feelings for Rachel. They’re super cute together. I think he was surprised at how much he cared about her and he never expected himself to be in that situation. Peter is stuck. He refuses to compromise on the engagement point but doesn’t want to leave her yet. Rachel: If I’m here putting myself out there, so will whoever is at the end. Rachel: You run from too easy. Peter: Maybe run is not the right word. I’m definitely not running, I’m here, and moving forward I can completely see football games, and baseball games, and the farmer’s market and wine night with painting. Rachel: What are your fears about marriage? Peter: I have no fears about marriage. It’s something that I really look forward to in life. Marriage doesn’t scare me. The idea of having multiple marriages scares me, and multiple proposals is to me one and the same. Peter: I didn’t expect to find someone who I truly, deeply cared about. But the hard part is, for me deciding if this person I care about is someone who I love and see as the one and only for the rest of my life. Rachel expresses that she feels like she’s forcing something to happen and Peter just doesn’t want her in that way. BINGO. This is it. But Peter can’t just let her go and keeps talking about the future. Rachel: I’m so confused about how you can see forever with me but you can’t do the step that you have to to get to forever. I don’t get it. That step is only one thing, ENGAGEMENT. We’re almost breaking the fourth wall here. In the real world, neither one of them would be having this conversation at this point, but we’re not in the real world. Engagement doesn’t mean wedding planning. In this context, engagement means putting yourself out there, taking a leap of faith, compromising and understanding the difference, and starting a new relationship. Peter won’t do it. I don’t think Peter is a “villain” and I don’t think he intended to get himself into this situation, but I do think he was a little manipulative at the end. Peter has created an impossible situation for Rachel. So we’re done here. In the normal world, this would be totally fine. This would be reasonable, rational behavior. But we’re on this show called The Bachelorette and everything ends in an “engagement” and Peter refusing to understand that or give in to it is a DEALBREAKER. Rachel doesn’t care about the Neil Lane ring. She wants a partner who is all in. Peter isn’t all in. DONE. Rachel: You don’t want to take the risk to move forward to what I want. I don’t want to take the risk to move forward to what you want. Peter asks if thinking on it overnight will help. Rachel: What’s going to change overnight? Even if it did I wouldn’t even feel confident. If it changes in the morning you would do it completely out of fear. You’d be doing it because you don’t want to lose me. Peter: I would do it for you. To prove to you that I want to pursue this relationship. Rachel: I don’t want you to be doing under peer pressure. Peter: I will make a sacrifice if I have to. Now you’re saying you don’t want me to. Rachel: I want you to do it because you want to do it. Peter: I want to do that when I feel like it is the correct time. Rachel: And you feel tomorrow is the correct time? Rachel: Exactly. Then don’t do it. Too little too late Peter! You think other contestants literally felt ready to marry the lead the night before proposal? No way. 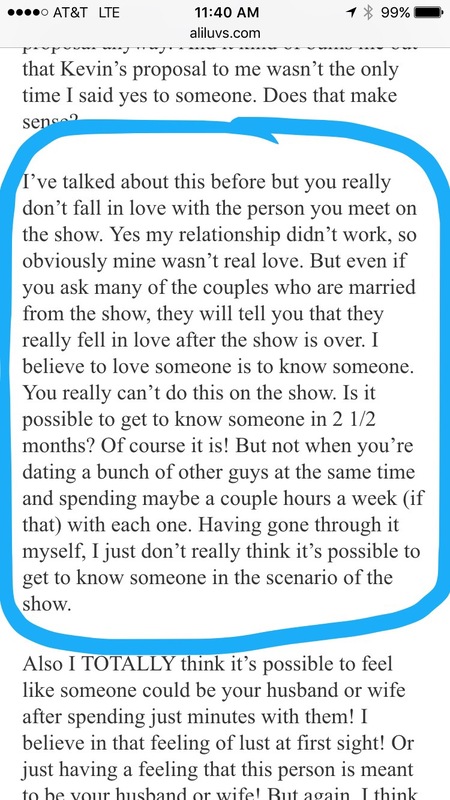 They all play along and do it because that’s how the show works and they take a leap of faith that the relationship will go somewhere after the show. He shouldn’t have put that back on her. He shouldn’t have made Rachel choose to have Peter disavow his morals (especially when he said he couldn’t promise he wouldn’t be resentful). Rachel is too smart for this. She knows how this will play out and he knows that she knows that. He makes her do the dirty work of leaving him, when he should have left her and told her his feelings just weren’t there. I do think Peter cared for Rachel. I do think he was confused. I don’t think he cared for her enough and I don’t think he should have proposed because it just wasn’t there for him. He should have owned up to that instead of making this all about how he can never propose more than once. Hundreds of thousands of people propose more than once and they’re doing just fine. Rachel is getting a lot of heat for how she treated Peter on the after show. I think she was a freaking master, but we’ll get to that. Rachel was clearly pissed. She had just watched back the show for the first time and heard Peter say: “Great. Then go find someone to have a mediocre life with.” You think she doesn’t understand all the things I’ve explained in this post? She’s pissed that Peter couldn’t get on board. SHE was the Bachelorette – she shouldn’t be getting constructively dumped the day before the proposal. I would be pissed too. There have been some rumbles about Peter as the next Bachelor. People are definitely #TeamPeter. There have also been some rumbles about how that’s what Peter wanted all along. I’m not that cynical (he would have left at top 3 if he wanted the gig because that’s the clearest way to it), but I do think that was impacting his behavior on the after show. And Rachel is right. He can’t have it both ways. If he is sticking to his story that proposal = marriage then he has no place on this show. Peter tried to say that he was too in his head this time around (leaving open the possibility that he’d be better next time). Peter: If I could take back one thing from the entire experience it was to get out of my head, to relax and open myself up more to you and to the process and I don’t know if I regret that but I definitely wish I could have done that differently. Rachel SHUT IT DOWN: I don’t know, I don’t think that’s what it was. When I look back and think about it and process the whole thing, what I think was so great was that you were true to yourself, and you took your time and you were at your own pace and I think that’s what was so great. But I just don’t think this world, this process, this journey, this show, I just don’t think it’s for you. You need more time. You need to see things through. You’re searching for something else. I don’t think it takes away from the person that you are and I think that you’re sincere and you’re genuine and it’s beautiful and I think you just need more time when it comes to these things, and I hope that moving forward you find whatever it is that you’re searching for and you move forward in that way. She then quipped that she’s “living her best life,” which seems to really offend the Internet. It was in a direct response to Peter’s comment about how she’ll live a life of mediocrity. I saw that as some sass, not an attack. And her comment about it not being right for him? NOT AN ATTACK. If it’s an attack at all, it’s an attack to show that Peter shouldn’t be Bachelor. Rachel: Why do you feel attacked!? I like Peter. I think Peter is super cute. I like that he’s rational, and I would much prefer to see him as the Bachelor than someone like Bryan. But Peter does not get to have it both ways. He doesn’t get to tell the lead that the process doesn’t work for him and then turn around and try it again with 25 women. If Peter TRULY believes that a proposal = marriage, he has no place on this show and certainly no place as the Bachelor. (I don’t think he actually believes that. I think he just wasn’t there with Rachel, which is fair. I think he should have owned up to his feelings and then he could go on his merry way as the Bachelor). Rachel schooled him. She even got him to admit that maybe the process isn’t right for him. Lawyered. I’ve rewatched the after show more than once. I don’t think she attacked him. I think people are reacting because they love Peter. That’s fine, Peter is a cutie. But I’m Team Rachel. It’s not an attack on him to say that maybe this process is not for him. If he really means it that he only ever wants to propose once, he should really not be the Bachelor. I’ll keep this brief. The finale was all about Rachel and Peter. I think the proposal was overshadowed by this. Bryan just doesn’t do it for me, but let’s not forget that Rachel has been all about Bryan since night one. They have chemistry, they are excited around each other, and Bryan has been there for her the entire time. He’s not my cup of tea, but I’m not the one who is engaged to him. I do not think Rachel took a consolation prize just for a ring. I trust her way too much for that. I do think Rachel had real feelings for Peter and it was hard to say goodbye to him. But almost all the leads have true feelings for more than one person and they still get engaged at the end of it. Desiree was absolutely gutted when Brooks left. I don’t think I’ve seen a sadder proposal on this show. But Desiree and the runner up are a success story with a baby. This whole show is messed up – it’s crazy to expect the lead to say goodbye to someone they love and then turn around and get engaged to someone else an hour later. That’s how it works, and it’s not fair to hold Rachel to a different standard than other leads just because we all thought Peter was hotter/smarter/more rational. I’m bummed that Rachel was forced on the defensive for her and Bryan. I don’t think it was the most lovey dovey After the Final Rose. I hope she’s super happy with Bryan and wish her nothing but the best. We’ll see what happens with Peter. I think the after show poked some holes in the narrative of Peter for Bachelor. For what it’s worth, I WILL WATCH ERIC ANY DAY. Maybe because I am a 40 year old woman, who has been married for 15 years, and also happens to be a Marriage & Family Therapist, but I would like to share a few things here: Rachel picked exactly what she needs at this time in her life. She picked a mature man who is not afraid or ashamed to pursue and express what he wants. Peter seemed to me either very calculating, or intimidated by Rachel and Bryan’s relationship to the point where he figured he would be better off throwing in the towel. She doesn’t need to fix a man at 32 years old. She needs a man who is READY…Bryan. I actually told my husband by week 3 that Bryan was a better choice for her, and towards the end when I saw how Peter was treating her, I said if she didn’t pick Bryan, it would have said to me that she has struggles with low self esteem. Glad her self esteem is in tact. She deserves a man who adores her, and WANTS to be with her. Another thing I want to share here is the fact that I believe culture is playing a role in people’s misunderstanding of Bryan’s bold affection. Bryan is Columbian, and people from that culture are very open with their romance and affection ( My husband and I best friends are Columbians), and living in Miami, I see that everyday, as we have many of them here. So, what seems impossible to us, is a way of life for Bryan. Just because we aren’t used to that, doesn’t mean it’s fake. Lastly, let’s not forget editing. Maybe, just maybe, the show was edited to make us feel like Rachel was more in love with Peter than Bryan. I think she was falling for Peter and Bryan initially, but as the weeks progressed, she realized that Bryan was a better choice for her. This is about finding a husband now, not a boyfriend. There should be no room for settling.